The United States, with an eye on the rise of China, is supposedly shifting its foreign policy focus back to the Pacific. As it does so, the U.S. should encourage freedom of the press throughout Asia as a part of this Obama strategy pivot. So why does Obama's State Department remain completely silent as Taiwan, one of our strongest allies in the region, gets pushed toward a media merger deal that would give communist China freshly-purchased power over the independent nation's press? Want-Want China Times, headed by media tycoon and close friend of the Chinese Communist Party Tsai Eng-Meng, has been seeking approval from Taiwanese regulators for a merger deal that would effectively give it control of half of Taiwan's print media industry. Eng-Meng is already distrusted by the Taiwanese for his close ties to Beijing, and his tendency to use his media empire in Taiwan to advance his own mainland business interests. Many in Taiwan fear that Eng-Meng, should his proposed media deal succeed, will use his new influence to push Taiwanese public opinion toward unification with the mainland. Students and journalists alike have been protesting for months, but the clock is ticking toward the March 27th deadline. The future of Taiwan's independent media is at stake. Taiwanese government regulators announced earlier this week that they have received all the necessary paperwork in order to review, and then approve or deny, the merger - but there's the possibility the government will lay down to the big business interests pushing the deal and allow it. Secretary of State John Kerry, if he and Obama plan to maintain the strong U.S.-Taiwan alliance and reaffirm U.S. support for an independent Taiwan, should publicly urge regulators to shutdown the merger. Such a stand would send a strong signal to Taiwan, to China, and the world that our support for freedom of the press does not stop at the water's edge. As a nation that values freedom of speech and a free press above all else, Americans everywhere should at least be aware of the disaster that’s about to happen to democratic Taiwan’s media market. Taiwan’s most popular and independent media organization, Next Media, is about to be sold to China-based tycoon Tsai Eng-Meng, in a deal which would give him and his company (Want Want China Times Group) control of 50% of Taiwan’s entire print news industry. Considering the fact that Want Want already controls many cable and television systems on the island, Eng-Meng is buying his way to being the top-dog in Taiwan's media market. The $600 million takeover is not so much a business deal as it is a proxy invasion of Taiwan’s independent press by the Chinese Communist Party. Eng-Meng, who is Taiwanese himself and holds large financial stakes in China, has been a vocal supporter of unification between communist China and democratic Taiwan. He is also an ally of Beijing’s communist government. These positions put Eng-Meng deeply at odds with the vast majority of the Taiwanese people. Free media watchdogs everywhere have been crying foul over the deal. Objections go beyond the inherent hazards of one individual controlling the lion's share of a nation’s media market; they center on the fact that Eng-Meng already has a record of using his existing media empire to promote pro-Beijing bias and censorship in Taiwan. As the Committee to Protect Journalists recently declared, "A media buyout in Taiwan which would put independent news outlets critical of China into the hands of a pro-Beijing media tycoon is cause for concern for the island's press…letting it pass unchecked could mark the beginning of the end for Taiwan's freewheeling media culture." The Taiwanese people are afraid of the deal and what it might mean for their free press, and have taken to the streets to protest. Last weekend, as many as ten thousand Taiwanese protested in the capital. Persuading regulators to stop the media deal from taking place was among their demands. The people of Taiwan have long been allies of the United States, and share our belief in freedom of the press, democracy, and sovereign peoples' right to self-government. The free people of Taiwan may be about to lose control over their own press to the Chinese Communist Party, without a shot even being fired. The American people, our press and our government need to stand alongside those in Taiwan fighting for free speech, freedom of information, and free press, and prove that our belief in those freedoms does not stop at the water’s edge. 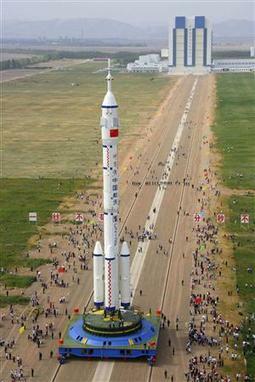 China's next manned space is scheduled to launch today. The Shenzhou VII spacecraft, with three astronauts, will lift off some time between 9:07 a.m. to 10:27 a.m. ET. This mission, only China's third manned space flight since it became the third space faring nation in October 2003, will feature China's first space walk. "I urge the Chinese leaders to engage in talks and make progress with his Holiness' representatives in addressing the just grievances of the Tibetan people," McCain said, with the Dalai Lama at his side. "I urge the Chinese government to release Tibetan political prisoners, account for Tibetans that have 'disappeared' since the protests in March, and engage in meaningful dialogue and genuine autonomy for Tibet." 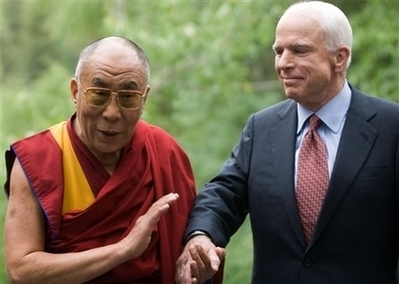 The exiled Tibetan leader said McCain had shown "genuine concern" for human rights, democracy and environmental concerns with regards to China. Senator McCain's meeting with the Dalai Lama demonstrates sympathy for critics of the Chinese regime at a time when the world's attention is focused on the country for the Olympics. The Dalai Lama has become a symbol of the struggle for Tibetan autonomy and political and human rights in China. China's government strongly objects to foreign leaders meeting with the Dalai Lama. McCain's visit with the Dali Lama draws another distinction between himself and the president, who's going to the Olympics. Does anyone believe that a record 19.4% increase in Chinese defense spending "will not pose a threat to other countries?" Maybe it costs a lot more to protect the Olympics these days. The Xinglong, Tianguan and Dongjing rivers were all affected by the pollution, according to the state news agency Xinhua. A chemical spill is thought be the cause, but the source has not yet been identified and an investigation has been launched. Gao Qijin, a water company official in Xinguo, Jianli County, told Xinhua that the water in the Dongjing river had become red with large amounts of bubbles. The pollution has also contaminated water supplies for about 200,000 people in central China. Meanwhile, Beijing is diverting water north for the Olympics, which means that in China's arid north, provinces already experiencing water shortages could be pushed deeper into crisis threatening the livelihoods of millions of people. China’s Environmental Protection Administration admits that the Three Gorges Dam is worsening water quality in several branches of the Yangtze River that drain into the dam's main reservoir. When the dam was completed, environmentalists warned that the reservoir behind the dam would likely get more polluted. "I find that my conscience will not allow me to continue business as usual," Spielberg said in a statement issued on a day when Nobel Peace laureates sent a letter to China's president urging a change in policies toward its ally Sudan. "At this point, my time and energy must be spent not on Olympic ceremonies, but on doing all I can to help bring an end to the unspeakable crimes against humanity that continue to be committed in Darfur," he added. In his statement on Tuesday, Spielberg said Sudan's government shouldered the bulk of responsibility for "these ongoing crimes" in Darfur but said China "should be doing more to end the continuing human suffering there." China is accused of providing diplomatic cover for Sudan's government as it stonewalls international efforts to send peace keepers into Darfur. China is also a leading oil customer and supplier of weapons to Sudan. A year ago, China attacked and destroyed an aging weather satellite in orbit. Debris from the Chinese anti-satellite missile test continues to threaten more than 800 operating satellites and will do so for up to 100 years. Let's start with what we know about China's ASAT capabilities today. And we know quite a bit. Because there are few, if any, secrets in space. Amateurs around the world track most, if not all, of the classified US military satellites from their backyards, posting their positions on the internet. NORAD,is capable of tracking objects as small as four inches across. In fact, NORAD's measurements of the debris caused by China’s January 2007 test were posted on the web. In the case of the Chinese test, the orbital tracks of that debris can be used to reveal the capabilities and limitations of China’s ASAT weapon by reconstructing the collision -- much like forensic scientists reconstruct a crime scene. By backtracking the debris to the point where they all converge, we can determine the two most important aspects of the Chinese ASAT: how China destroyed that satellite, and just how capable its satellite-killer really is. The interception was almost head on at a combined speed of almost 18,000 miles per hour. The pieces of debris wound up with the greatest speeds—much higher than the original satellite. This means that China accomplished the most sophisticated of space maneuvers: a hit-to-kill interception, the equivalent of hitting a bullet with a bullet. This is equivalent to what the US is trying to develop in its national missile defense system and is much more sophisticated than the ASAT the Soviet Union was working in the 1980s: little more than a space mine that slowly snuck up on its target and detonated near by. We also know that the ASAT was highly maneuverable. Yes, the target satellite’s orbit was known well ahead of the interception. However, that does not mean that the satellite’s position was known well enough that the ASAT did not need to steer itself to hit the target. In fact, it is very likely that the interceptor needed to maneuver at high speeds, perhaps as much as six times the acceleration of gravity, to hit its target. The orbital speed of the target satellite, which is determined by its altitude, also provides us with significant insight into the interceptor’s capability. The closing speed of the interception, which is a combination of the target satellite’s orbital speed and the speed of the interceptor, determines how much time is available to make final adjustments. For instance, just one second before the collision on January 11th, the interceptor and target were five miles apart. During that one second, the interceptor had to make any final adjustments to its trajectory to hit a target smaller than six feet across. Any decrease in the closing speed makes the attack that much easier. Since orbital speeds decrease with increasing altitudes, the Chinese interceptor would find it considerably easier to hit a target in higher orbit. Finally, the interceptor needed to track its target, so that it could determine where it should move to place itself in front of the obsolete weather satellite; we have a good sense of how that was done, too. The most likely method it employed to track the oncoming satellite was an on-board telescope using visible light. Locking onto a target this way -- as opposed to focusing on the infrared light emitted by the heat of the target, the way the US missile defense interceptor does -- imposes significant limitations on the system. In particular, until it develops a far-infrared capability, which is probably decades away, its ASAT will be forced to attack satellites while they are in bright sunlight. Dr. Forden is optimistic that China would lose a space war with the U.S., at least for the foreseeable future. The 8,000-member crew was due in Hong Kong on Wednesday for a four-day visit to celebrate the Thanksgiving holiday. Some were planning to join family members who had flown in from the United States, Japan and the Philippines. While the ships were nearby in the South China Sea, the Chinese Foreign Ministry issued a “last-minute” refusal of the port call, the State Department said. China reversed the decision to refuse entry to the Kitty Hawk Thursday and said that the visit could go ahead "based on humanitarian considerations," but only after the Kitty Hawk headed for its home port, the missing families who had flown to Hong Kong to celebrate the Thanksgiving holiday. Hong Kong has long been a favored port of call for the U.S. Navy. In the 10 years since Britain handed the former colony back to China U.S. Navy ships have occasionally been barred from Hong Kong when relations are strained. So why the slap at the Kitty Hawk, its sailors and families? In recent weeks, ties have been strained over disputes on trade and 's nuclear program as well as Congress's awarding a medal to the Dalai Lama, the Tibetan spiritual leader whom China's Communist government considers an enemy. The Los Angeles Times reports China's abrupt action could relate to displeasure over an upgrade to Taiwan's Patriot II antimissile shield; a desire to send a message before an imminent Hong Kong election; and U.S. criticism over Chinese espionage activities. 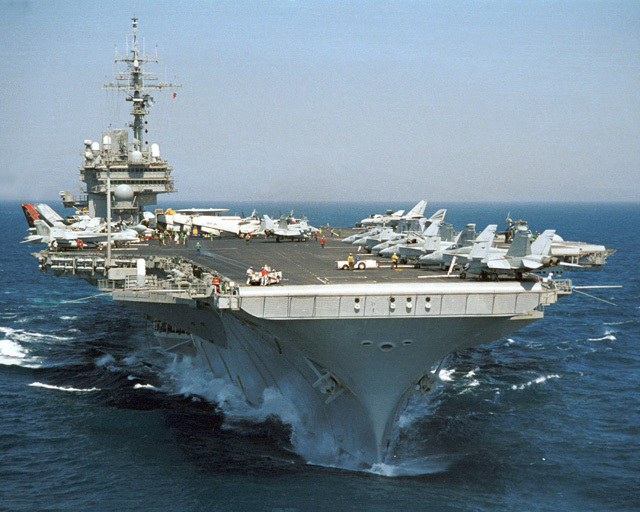 The cancellation of the Kitty Hawk’s visit was not only a disappointment to U.S. sailors and their families. Foreign servicemen and women, mainly from American ships, spend tens of millions of dollars in the city.